Palm, MobileOne and Microsoft have announced the first Asian availability of the new Palm Treo 750v smartphone, bringing for the first time to Asia the Palm experience on Microsoft Windows Mobile 5.0 over a wireless 3G/UMTS network. The new Treo 750v will be available next month through M1, Vodafone's network partner in Singapore. "Global expansion is a key part of Palm's growth strategy, so I am pleased to announce our Vodafone relationship now extends into Asia Pacific," said John Hartnett, Palm senior vice president, global markets. "With Vodafone in Europe and now M1 in Singapore providing the Treo 750v smartphone, we can deliver a robust, business-ready device featuring the Palm experience, accelerating our momentum in the enterprise market." Today, only an estimated 3 percent of business email inboxes worldwide are accessed via mobile, according to market research firm The Radicati Group. The new Treo 750v will allow Palm to target this large, untapped market with push email platforms such as Microsoft's Messaging and Security Feature Pack (MSFP), which includes Direct Push Technology and enhanced security features free out of the box. This business-ready solution addresses the need for a robust push-email platform that can be deployed easily by small businesses to global enterprises. In June this year, M1 was the first network in Singapore to offer the Windows Mobile Email solution. - Dedicated messaging application for SMS/MMS that is organized in a "chat thread” so users can reference prior messages and use emoticons for a personal touch. The Palm Treo 750v runs Windows Mobile 5.2 Pocket PC edition. It is powered by a 300MHz Samsung processor and has 128MB nonvolatile flash memory (60MB available for storage). The display is a 65k colour, 240 x 240 pixel touch screen. It has integrated Bluetooth 1.2 wireless technology, but like previous Treos does not include Wi-Fi support. It has a new side mounted mini-SD memory expansion and a 1.3 megapixel camera with 2x digital zoom. The wireless phone is a quad band GSM/GPRS/EDGE/UMTS radio. It supports the 850/900/1800/1900 GSM bands, and 850/1900/2100 UTMS bands. The battery is a removable 1200 mAH Lithium-ion, good for a claimed 4.5 hours GSM / 2.5 hours UMTS talk time, with 10 days standby time. It has dimensions of 111 mm x 58 mm x 22 mm (4.4" x 2.3" x 0.8" inches) and weighs in at 154 g (5.4 ounces). The casing is slightly slimmer than the 650/700 series and the casing has a "soft touch" paint finish. 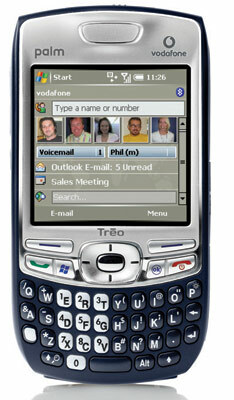 It is also the first new Treo model to have an internal antenna. "M1 is committed to helping our business customers increase productivity and make the most of their business and personal time," said P. Subramaniam, M1's director of Enterprise and Alliances. "We are privileged to be the first telco and Vodafone network partner in Asia Pacific to launch the new Treo 750v with Palm and Microsoft. The unparalleled ease of use offered by the new Treo 750v, together with M1's high-speed 3G network, will provide a compelling mobile-computing solution to M1 customers." Wow, are you serious?! That will be crazy money by the time it arrives in Canada. Glad I moved back to a PDA/cell combo and saved a boat load of money. where are you getting this info from? The carrier would probably subsidize this substantially as it's going for around 300-free in European countries. Not sure where he got the pricing, but personally, I hate contracts and being locked in to save some bucks. In the long run, you need to keep that phone for 3 years to see any huge savings which most of us don't. I love buying unlocked GSM phones and just slipping my sim card whenever I feel like I need an upgrade. Selling used unlocked cell phones have greater value too. $300 to $800+ according to at least one site. Some how the use of the phrase "the Palm experience" doesn't fit when you also use Microsoft Windows Mobile in the same breath. I agree it is taking on the Blackberry look. Check this out. I like this widescreen idea. I would sacrifice size for a widescreen display with small font capability. Perhaps if they had a wide format the device wouldn't need to be so bulky. If RIM produces more stylish devices, the Treo needs to keep up. Though this new device without the antenna is a good start. > widescreen display with small font capability. $399 contract free all over Europe. Just watching the market as to the shape of Smartphones and PDA's can reveal what the industry is thinking about. Or more likely, what we are asking for. Thumb keys are almost the standard anymore. The removal of an antenna is without dispute a GREAT idea. Now it comes down to the screen shape and size. Of course, the background thoughts are power, speed and versatility, but let's face it, if you can't read it , what's the point? Imagine the Treo becoming more stubby. That is, it is wider than it is tall. Now it begins to mimic other Smartphones, but that isn't all bad. It is truly about functionality. We sometimes become crapmed by our own limited ability to think it through to the end or the next plane. Take Jeff Hawkins, he walked around with a block of wood in his hands for a long time while he mapped out the Palm as we know it. And where did that take him and the PDA? The rest is history. With changes like that as a potential for the Treo, I may just break down one day and retire my LifeDrive. They will of course have to allow you to take the phone to your own carrier and support it. Am I the only person who values the Treo's narrowness? I don't really like the wider format that most of its QWERTY competitors have opted for. It makes them both dorkier-looking when you hold them up to your head, and less pocketable when you're carrying them around. I agree. I have played a little with both the Blackberry and the Nokia E61 and they look funny and feel... unnatural. While I would like a larger display it would probably have to be LONGER with the abbility to rotate. But then what do we do with the keyboard. Assuming Palm would produce a 320x480 screen Treo without a keyboard I would probably stick with the smaller screen, the keyboard is just too important. I like everything but the shared-keys QWERTY keyboard. I despise shared-keys. Nice design and display. Palm should hire some design and engineering people away from Sony. Count me in on the antenna-less direction. As for the candy bar shape and thickness, etc, I'm fine with it. But if Palm switches around the Treo hardware buttons any more I'm gonna put a flaming bag of poop on their doorstep - it's madness when you have to support or use more than one model! With Graffiti 1->2 they had a plausable excuse to screw up the Zen of Palm... but radically switching around the hardware buttons every time they release a model is absolute folly. Where's they stick the power button on the 750v...? ...behind the battery cover...? Where's they stick the power button on the 750v...? ...behind the battery cover...? No, the button to answer phone calls is behind the battery cover. The 750v power button is in the SD card compartment, under the SD card. I hear Seidio is releasing an aftermarket SD card slot and a series of custom SD cards that have strategically placed holes that allow the Treo 750v to be turned on without removing the SD card and the cover. I thought that they moved the antenna inside where the battery once was on the 700p and 650 - and the battery has been replaced by the PalmPowerPack(c) that sits on your belt and is connected via cable through your armpit and down your sleeve into your hand and conveniently plugs into the Athena(c) connector on the 750v. Speaking of Seidio - they'll be coming out with a "high capacity" PalmPowerPack(c) knockoff. It'll be a bizarre shade of misty blue, about the size of a motorcycle battery but with curved edges, and they guarantee at least 2-3 days of heavy internet usage of your Treo on a single charge. The release of this product will be delayed a couple months because designing a proper belt clip is killing the engineers there. And oh yeah - it's Graffiti 1 compatible! Palm puts 1.3 megapixel cameras in their devices from fear the extra concentration required to admire the finer details produced by higher resoluation cameras may induce strokes and seizures in Treo users. They also leave wi-fi out for fear of the signals being used to control and hypnotize the brains of Treo users by extra-terrestials, Taliban, European socialists/communists, overgrown lizards or even your own neigbourhood bogeyman (eg http://www.blogger.com/profile/86735). Palm uses the massive growth of WinMobile devices with wi-fi as proof of this threat: "Nobody would buy WinMob devices if they weren't under wi-fi control; it's so powerful even we've been manipulated into creating WinMob devices!" It's sad that people don't appreciate just how much Palm is looking out for our health, safety and security. When does the non-crapware version get released? RE: When does the non-crapware version get released? I think this is it...I mean, Garnet's not on the spec sheet. But wince is on the spec sheet. I guess there is not and never will be a non-crapware version, then. Is it only me, but I can't see any camera in the front? Isn't this nice to have with a 3G phone?! Is the MiniSD slot IO compliant? Would it be possible to use a miniSD wifi external card - easily available? Would the WinMob driver work or are we going to need some clever geek to manipulate the 700w driver? There are MiniSD WiFi cards. Generic Windows drivers will work, they do for the 700w. I don't know if the slot is compliant, but it should be.